A knot is tied, a wish for good luck. At temples you are able to get your fortune, and with your fortune you can get Great Luck, Luck, Not So Good luck and Bad Luck, well not in those terms, but you get the idea. 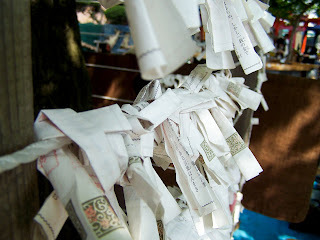 If you don't get much luck you can tie your paper on ropes at the shrine and it is supposed to give you more luck.